The shop looks amazing, so bright and beautiful. Well done to you both. All your hard work it pay off for sure. Good to have you back sweetie, I've missed you and your fab little shop. Look forwrd to seeing more of you now you're back in blogging mode. Ps maybe I could send you a trade price for some little bits and bobs, pegs and hearts etc.. ? cheeky I know. Drop me an email honey. Hello Jennifer, so glad you're back with us, I missed you! 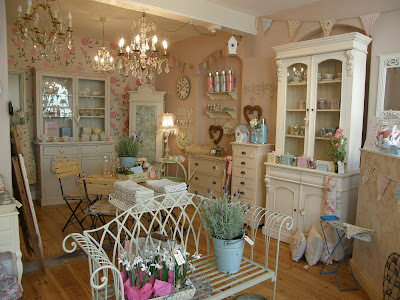 The shop looks lovely, when can I move in? Hi Jen, I'm gald you're back in blog land. The shop looks great - look as if you've moved away from CK polka dot, country cottage chic to more oppulent French inspired pieces. Hi Jennifer. I found your blog some time ago and subcribed to the RSS feed. I liked to old photo's of your shop, now it looks even better. Good luck with redecorating the storage/studio. Yeah, your back. I came a week to early when I visted Watchet as it must of been Clive sanding away in the shop. Oh my goodness it is soooo beautiful, you must be so proud of yourself to own such a gorgeous shop. Lovely to hear from you again. Your shop is truly beautiful, wish I was nearer to come and visit. Look forward to seeing your studio pics. I wish I lived closer so I could come and visit. Your shop looks amazing - well done. Hi Jennifer - So glad you are back!! I have checked often and been hoping all is OK in your part of the world!!! The shop looks absolutely beautiful - so wish I could just pop over for a look - shame about the 24 hours on a plane between here and there!!!!! I've just put you into my 'feeds'. Looking forward to your next post. WOW! It was certainly worth all the hard work - it looks amazing! I'd love to come and browse for a few hours! goodness.. your shop looks so beautiful now.. I love the way it looks. btw I am glad to see you back in here again.. hope to see more of you in here.. with more pictures of course! Yay, you are back! Hurray! I've missed you. Fab to see you again sweetie pie, ooohhhh and your shop looks absolutely amazing, well done on all the hard work. Welcome back Jen, so glad to see you and the amazing new look shop. It all works well, colour scheme and stock. Wish you were nearer, but there again its a good job you are not as I would be penny less! Hope things are good with you, can't wait to read more. Every single thing looks so dreamy! 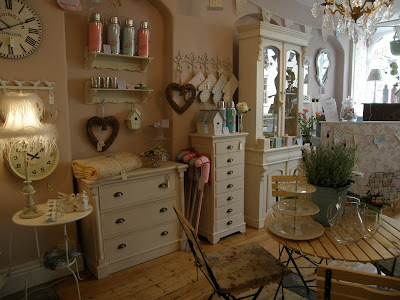 How lovely to see you posting again, your shop is looking devine. It looks absolutely wonderful! Can I live there???? been keeping an eye out for you, hoping the shop was doing well for you - it looks fabulous! well done you, and I wish you every success! it is a shame I am so far away...would love to see the shop and you in person. Hi Jennifer, so glad you're back. The shop looks really fabulous...how hard you must have worked on it...great result! It's about time I stopped lurking and said hello and how pleased I am to see a new post from you! Yay! 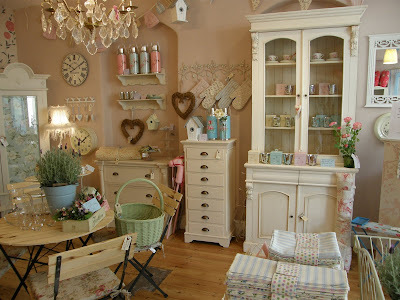 Your shop is stunning, it's bright and full of interest without being cluttered. I could spend a lot of money in there! Oh, my goodness! It's probably just as well I'm across the pond 'cause your shop is EXACTLY the sort of place I tend to go crazy and spend lots of money! Absolutely gorgeous. It must be such a pleasure to spend your days in such a beautiful environment. I'm happy for you. The shop looks beautiful, as usual!! I'm hoping I may try and make the journey in my three weeks off over summer. The only problem is that I know I'd want to buy everything!! Nice to see you blogging again. Well, you've certainly been missed! Like a lot of other bloggers I have kept returning only to be disappointed to find no new posts but now we know you've been busy and your shop looks gorgeous as always. Hope you are doing a roaring trade. Looking forward to lots more posts!! Lovely to see you back Jennifer. I was lucky enough to visit your lovely shop. Hopefully next time it will be without small, bored people! SUCH a pretty shop.. you have worked so hard. These photos have made me more determined than ever to get over and visit one day..
Hopefully now the school hols are coming up I will have more time..
More time... ? ... that would be nice! Just me again, I just wanted to let you know that I have passed on a little blog award to you as you are one of my fav blogs. 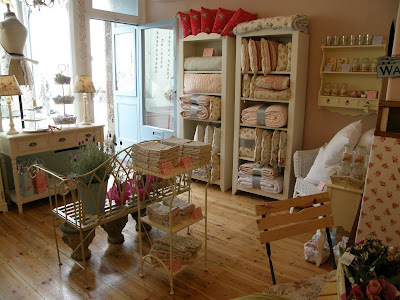 It's lovely to see you back blogging again and your shop looks absolutely gorgeous. Well done on all your hard work. Your shop is very nice. I wish I could visit. Jennifer....this is just beautiful! I really enjoy your blog!! I wish I was closer and could stop by and take a look. You've made it SO pretty and inviting. Hi Jen, lovely to have you back blogging!! Loving the shop even more now, it looks amazing!! my english is not good, but I want to say: you are a lovely young lady! I am very impressed by your shop and your pictures! Really wonderful. Sometimes, In the internet I was looking for somerset and I am shure this country will inspirer you! Sometines I will visit your shop. Your shop is lovely! I could brouse all day. I can't tell you how often I've clicked on your link and been tempted to delete it as a fav because I thought it was sadly abandoned....I'm so glad you're back! I had only just found you in April and you are very much worth the wait! Lovely and lovlier--your shoppe is awesome. I'm Lori from Buffalo NY and wish I could teleport myself to your pretty digs. Welcome back and nice to meet you. It looks really lovely, I'd love to shop there!! I'm glad that yoyu are back! welcome return to the land of blogging. Your shop looks great, btw. Hello! 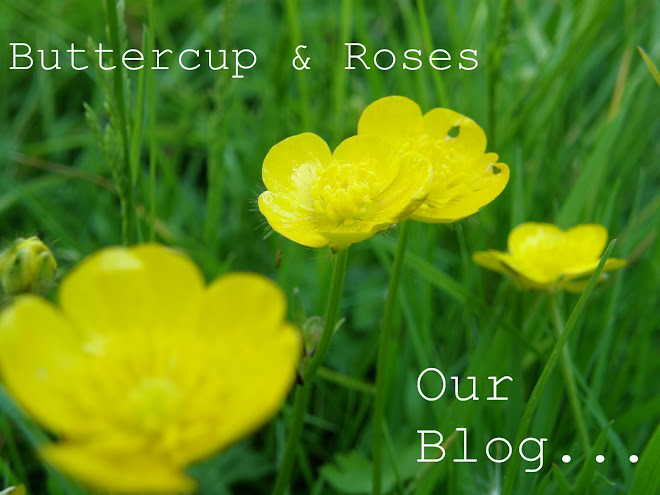 I'm new to blogging and just came across your blog by chance, I love it and the shop, it's lovely. I got a bit excited at the fact it's in Somerset where I'm off to on holiday in August, if it's near I'll have to drop in! My name is Jenny, and I am from the Jersey shore...outside of NYC. I just came across your super sweet blog/shop! Love it to bits!! Everything is so cozy and sweet! I look forward to visiting often! I love reading your blog, it's always full of lovely pictures full of beautiful things. Your shop looks beautiful. Thank heavens I don't live closer, I'd be totally broke!! Your store is GORGEOUS!!! Wish I lived close so I could visit!! Just stumbled upon your blog and your shop is gorgeous. Well done and you have a great eye for a vintage buy. It's great when you can work in an industry you love, I too adore this world and spend all my time lost working in it. Hello Jennifer, that's amazing! Wonderful, warm and bright! Can I live there????? Please!!!! Love the shop and your home looks amazing!